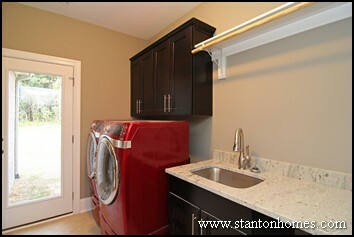 Large laundry rooms and mudrooms are very popular in new home designs, especially as a transition area between the garage and home space. Here are our top 5 most popular mudroom designs for 2016 new homes, with tips on how to maximize the utility of your square footage. These mudrooms are designed with everything just the way you need it, from layout to storage centers and fixtures to flooring. 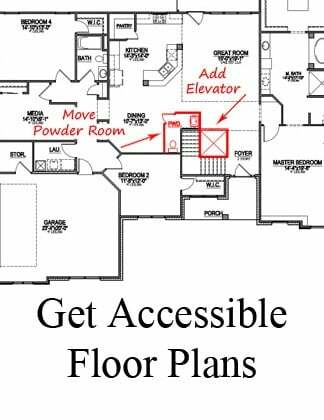 What does your family need to get out of your mudroom? Let us know what you do in there and we'll show you more ways to work it out. Low-maintenance custom tile flooring makes clean-up easy, too. See more photos of this home - a version of the Maple Lane - by clicking here. If your family includes children and pets, you'll appreciate this "home hub" design that melds space and storage in one convenient room. 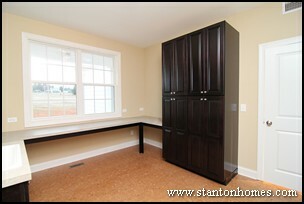 The perimeter of the room is wrapped in cabinets and built-in countertops. Tall cabinets are designed to house large cleaning tools and supplies. A sink base cabinet with faucet and sprayer is added for filling pet dishes and pre-treating clothes. 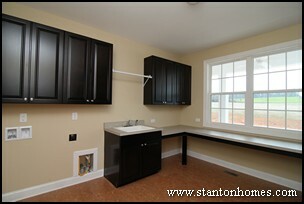 Areas below the countertops are left open as a feeding space for pets. 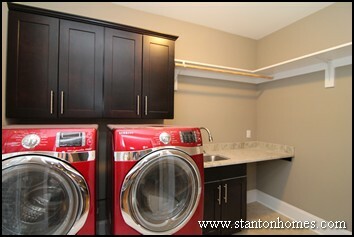 Above the sink an open area is fitted with a rod for hanging hand-laundered delicate garments. A large bulletin board is added to display children's artwork, calendars, soccer and dance schedules and appointments. The countertop back splash areas is fitted with extra outlets at desk height - perfect for a phone and camera charging station. "green," 100% washable, kid-friendly design. The remaining open areas are designed to house large baskets of outside plastic toys and seasonal gear such as scarves, mittens and hats. See more photos of this home - a version of the Carwile - by clicking here. A fully efficient design saves space, no matter what you pack into it. 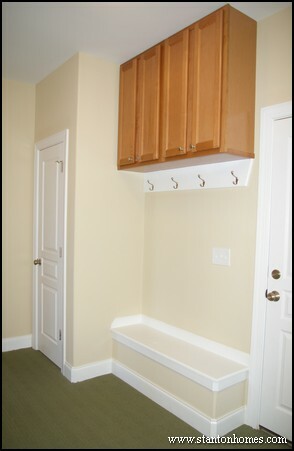 This mudroom, pictured from a version of the Woodlake, maximizes storage capacities and space utilization. 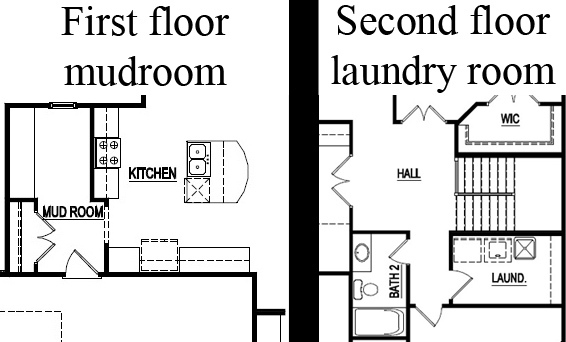 This version of the Woodlake floor plan provides access between the kitchen and backyard, directly through the laundry room. Mudrooms can merit their very own space. 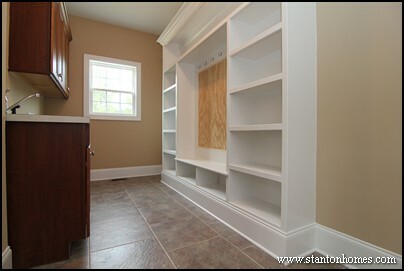 In this home, a version of the Brogan, a first floor mudroom was added in addition to the second floor laundry room. 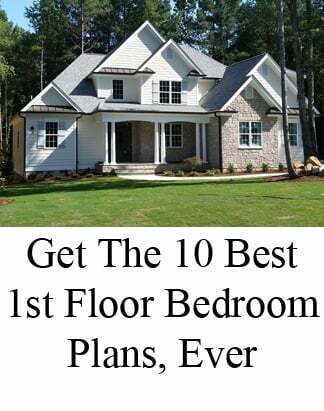 Choosing to build your new home with exceptional NC custom home builders like Stanton Homes gives you the flexibility to add details that make your life easier. 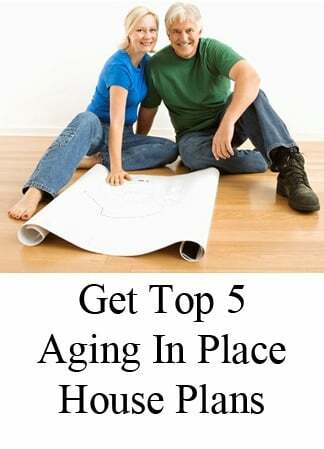 Find out more today – click here to get started. How big should the Island Be? 1. How large is your kitchen? 2. 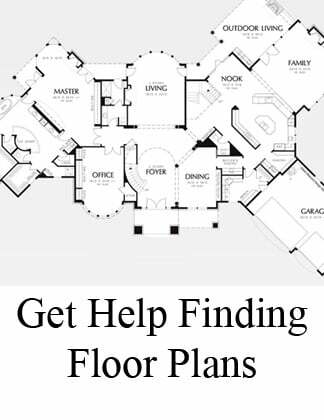 What shape is your kitchen floor plan? 3. Do you want to incorporate seating? 4. Will you need a secondary / prep sink? 5. What functions are most important? 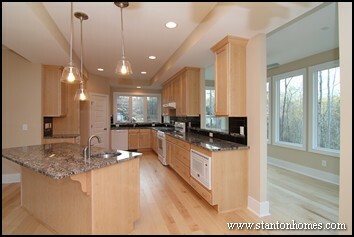 In general, islands work best in larger kitchens and peninsulas work better in smaller kitchens. Kitchen design tip: you want enough space to navigate around the island - maximizing the functionality of the extra counter top and cabinet space it provides. Long, thin kitchens work best with a thin rectangular island. Wider or more square kitchens work best with a wide rectangular or angled island. 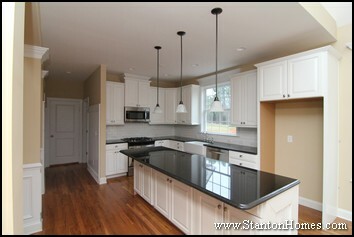 The shape of your kitchen will help determine the size and shape of your island. Most islands can be expanded to incorporate bar-height OR counter-height seating, as long as the kitchen floor plan is large enough. 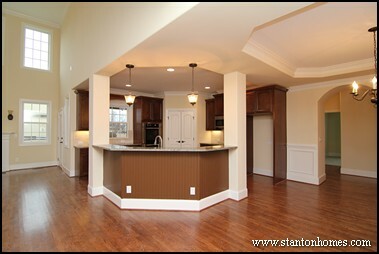 In this example photo, the island was angled towards the great room, slightly off-set from the kitchen. The counter height seating creates a smooth, clean look that matches the contemporary lines of this home. 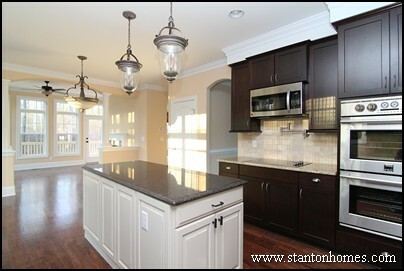 Click here to see photos of a home with two kitchen islands - one designed for table-height seating. Prep sinks are gaining popularity in 2014 new home kitchens. When thinking about your island size, keep in mind where the prep sink will go. 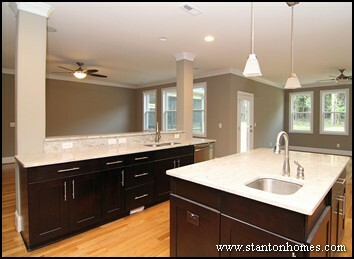 Dual sinks are generally placed on opposite ends of the kitchen - maximizing utility and efficiency. When thinking about your ideal island design, will it include tons of storage? More counter space? 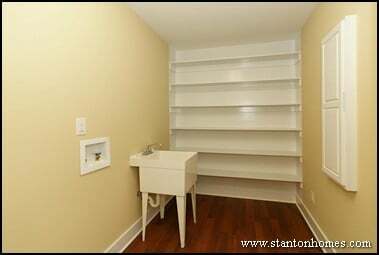 A place to add a wine refrigerator? 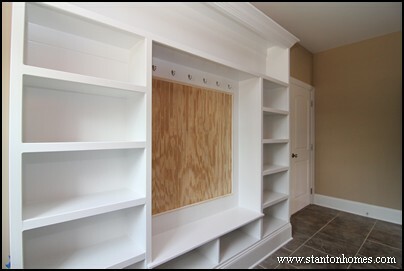 Many island have two-sided cabinets (such as examples 1 & 4 in this article) for easy-access storage. If you want counter space, re-think adding a prep sink. An island may be the ideal place to add a drink fridge.